The world is losing its important cultural-heritage sites faster than they can be preserved. Unlike artifacts, safely housed in museums or private collections, heritage sites are exposed to the ravages of time, environmental degradation, and human interventions that range from poorly managed tourism to looting and acts of war. With its partners at Texas Tech University and the University of California (UC) at Berkeley, CyArk developed High-Definition Documentation (HDD) as the core methodology for documenting cultural-heritage sites. HDD is an integrated method that uses advanced survey and imaging technologies, including laser scanning, Global Positioning System (GPS), high-resolution and high-dynamic-range photography, digital modeling, and other advanced spatial technologies and methods. An HDD survey provides the soundest foundation record for cultural-resource management. It produces a comprehensive dataset that can be further developed into a diverse set of deliverables serving multiple purposes, including site management, condition assessment, conservation, structural analysis and archeological interpretation. High-Definition Documentation uses advanced survey and imaging technologies, including laser scanning, GPS, high-resolution and high-dynamic-range photography, digital modeling, and other advanced spatial technologies and methods to document cultural-heritage sites. IMG1RIn addition, HDD delivers visually rich 2-D and 3-D digital images that, when combined with advanced imaging and animation processes, become visually rich resources for education. When a cultural-heritage site is so endangered that it faces destruction, HDD may be the only way to preserve it for history. HDD begins with preliminary research that covers existing maps, plans and other relevant documents. 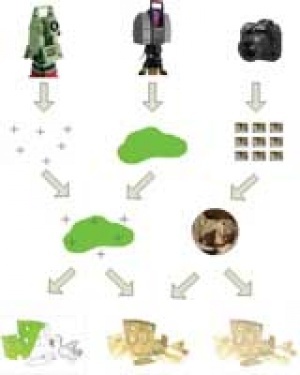 This is followed by actual project planning for which the most valuable tool is the instrument-setup location plan, consisting of a scaled site plan for locating and coordinating field instruments (typically laser scanners, photography equipment, total stations and targets). It's important to note that the same setup locations are used for collecting laser-scan and photographic data. The instrument-setup location plan also is essential for coordinating the control-survey network. CyArk created a planning template in Autodesk's AutoCAD, with standard layers for creating an instrument-location plan from a pre-inserted, existing site plan. IMG2RInstrument-setup locations should take into account the scope of work, resolution and products that are to be created from the HDD, and they're primarily driven by laser-scanning capabilities. It's most efficient to minimize the number of setup locations needed to capture the surface geometries with as few occlusions in the point cloud as possible, minimizing the need for patch scanning. Many modern scanners have a 360-degree field of view and a range of up to 300 meters. As a rule of thumb for cultural-heritage sites, setup locations should be no greater than 100 meters from the subject, if possible, and should allow for 20 percent overlap between the scans that are to be registered together. For cultural-heritage sites, it's important that the HDD dataset doesn't result in a standalone, geographically de-contextualized product. For this reason, survey control is an essential part of HDD. Survey control allows for external checks on the scan-registration process and ensures that the HDD relates to established, recognized geographic coordinates. If the survey control is of a higher accuracy than the scan data, it can be used to determine the relative accuracy of the scans. Survey control also can be used to transform the scan data into another coordinate system. This is useful to reference the surveys to a global coordinate system of latitude and longitude. Transformation of the coordinate system also helps establish vertical control and an accurate line of gravity. The control-survey network is essential to register the scan data with other global site data, such as topographic maps and/or digital terrain models. Existing permanent and/or newly placed survey targets will be used to register the laser-scan and photographic data to an existing or newly created survey-control network, which will be the basis for quality-assurance procedures. Survey control should be used in all cultural-heritage projects. Laser scanning should conform to established civil-engineering best practices, with some additional considerations regarding cultural-heritage sites. Target locations shouldn't be any further than 50 meters from the setup locations, with a minimum of three targets for each setup. This will ensure that targets can be acquired by the scanner. In some cases, the targets may be the only control used in registration. Point-cloud resolution should be accurate to 0.66 millimeters or better. Scan coverage (resolution) of 10 millimeters should be achieved for structures, and 50-millimeter resolution should be achieved for topographical features. Point-cloud scan sets should be georeferenced in the field and registered to other scan sets on a daily basis. This ensures onsite quality assurance and leaves no guesswork regarding patch scanning. There will be occlusions despite the best advance planning, but this can be rectified by adding patch scans of missing data. Patch scans may not need targets or other controls, because cloud-to-cloud registration will produce highly accurate results. Laser scanning may perform more functions than survey documentation. It may be used as an active, onsite, archeological and conservation tool. IMG3RAt the archeological site of Chavin de Huantar, Peru, for example, a combined research team from UC Berkeley, Stanford University and CyArk used the point-cloud data to calculate the depth of an underground gallery network to assess the geological overburden as part of an ongoing analysis of its structural stability. Moreover, scan data were used to locate a new excavation to connect a collapsed section to the gallery. 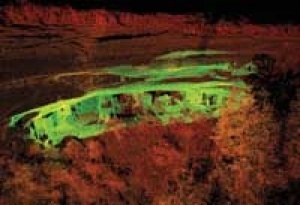 Photographic data integrated with point-cloud, laser-scan data are central to HDD methodology. HDD photographs are predominantly high-resolution and high-dynamic-range data, the latter of which ensures visual resolution under a variety of lighting conditions by effectively bracketing exposures and optimizing the lighting in the final data output via appropriate software. Photo data typically are taken from the same location as the laser scanner, often using the same tripod, so the photos include all the same surfaces and are from the same point of reference. For setup locations that include more than one scan or a larger than 40-degree field of view, panoramic photography is recommended. This is known as the Setup-Based Method. A variety of procedures, such as photographing for texture and relighting, can be added to further enhance quality. A procedure that bears mentioning is photographing for increased resolution. In this procedure, photographs are used to increase the effective resolution of the scan data by fusing the higher-resolution photographic data to the lower-resolution scan data. An example would be a 10-million-point scan of a room fused with a 600-million-pixel panorama taken from the same setup location. This would increase the resolution of the scan 60 times, making it possible to create drawings showing subtle cracks and other details not found in the scan. 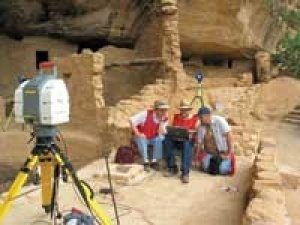 At Mesa Verde National Park, CyArk used this method to create Level 1 Survey data of a wall at Spruce Tree House. The combined scan and photo process resulted in a time savings of more than 64 percent compared to previous archeological survey methods, and HDD is being adopted by the Park Service at Mesa Verde as a new best practice. As a rule of thumb, the time required to develop data is two to three times that of field collection, but an HDD dataset yields a diverse range of deliverables. The 3-D point-cloud models can be used directly as metric tools. Orthorectified and/or sliced, the point cloud produces 2-D computer-aided design architectural drawings. As an important diagnostic tool, an HDD dataset can be converted to models used for structural analysis. HDD photographs and panoramas constitute a chromatically accurate portfolio of images. When photo data are fused with a 3-D point cloud, a 3-D photo-textured model'virtually a 3-D photograph'is created. In addition, such models can be processed into animations. With advanced modeling software and accurate historical information, the point-cloud model can be further transformed to deliver a highly accurate historical reconstruction. Collecting a variety of data and media types, multiplied by developing more data and media types, creates a management challenge that begins in the field and expands in the lab. To address this, CyArk developed a database system and associated metadata schema to manage HDD data collected at cultural-heritage sites. The database is relational by type, and it functions as the structure for the CyArk 3D Heritage Archive. The database system operates as a management tool, allowing users to locate data and media within the open-source system based on MySQL software. Supporting the database is a beta-version mobile metadata entry system, which allows for real-time field entry of metadata relating to digital data produced by all the HDD instruments. When fully developed, this tool will provide seamless integration of field-collected metadata with the database of the CyArk 3D Heritage Archive, delivering cultural-heritage site data via the Internet. The CyArk 3D Heritage Archive serves a broad range of constituencies, ranging from heritage-site authorities; cultural-resource managers; historic-preservation professionals (e.g., archeologists, conservators, architects, engineers, etc. ); scholars, educators and students from university to K-12; and a general public interested in cultural-heritage sites. Access to the Internet archive is tailored to user needs and the proprietary requirements of each heritage-site authority. Therefore, the archive can be entered through three portals: Site Manager, Professional and General Public. The Site Manager portal permits the highest level of access and is reserved for a specific site's particular heritage-site authority. From this portal, there's full access to all data. Moreover, the site authority can manage, work and further develop data online. This portal currently is in beta development. The Professional portal allows scholars and heritage-site professionals, who have secured permission from CyArk, to view data at a larger scale and download data from permitted sites. For the General Public portal, the archive is open to view all the data and its associated media, but users may not download the information. The CyArk 3D Heritage Archive is a powerful and intuitive system for accessing point-cloud data, 3-D models, photos, drawings, videos and other archival-grade media derived from HDD. Users can browse an interactive map for each of the heritage sites and explore the collection of media associated with it. The types of archived materials include 3-D point-cloud models, 2-D architectural drawings, high-resolution photographs, photo-textured models, high-resolution panoramas and animations. Moreover, the archive is interactive. A "Community" section hosts forums on a variety of subjects pertinent to cultural-heritage sites. CyArk has developed a soon-to-be-released Point Cloud Viewer, which will enable users to manipulate the 3-D point-cloud models, take dimensions, create architectural drawings and investigate a subject from any viewpoint'all online. To date, data have been archived from the cultural-heritage sites of Angkor, Ancient Thebes, Pompeii, St. Pierre de Beauvais, Salvador de Bahia, Tikal, Tambo Colorado and Mesa Verde. Forthcoming projects include the Statue of Liberty, a section of Cairo's Ayyubid Wall, Pisa's Basilica and Tower, and more sites in Mesa Verde. In supporting the documentation of cultural-heritage sites, CyArk exercises cooperative advantage, which, unlike competitive advantage, comes from collaboration and developing partnerships that multiply the resources beyond those of any single entity. CyArk's staff has extensive experience in scanning, digital photography, data development and database engineering, and such experience is leveraged by collaboration with others. CyArk's partners are heritage-site authorities, historic-preservation institutions, universities, government organizations, private service providers and individuals. It's because of collaboration that CyArk can achieve significant economies in documentation projects in which resources are limited. Cultural-heritage sites are typically under-funded, and there's often a large gap between heritage-documentation budgets and commercial fees. CyArk works to close that gap. CyArk is a nonprofit project of the Kacyra Family Foundation, which is located in the San Francisco Bay Area. It joined the global community of heritage-site preservation in 2002. CyArk was founded by Ben and Barbara Kacyra, who previously developed the first commercially available long-range 3-D laser scanner through their company, Cyra Technologies, which was acquired by Leica Geosystems in 2001. CyArk's mission is "preserving World Heritage Sites through collecting, archiving and providing open access to data created by laser scanning, digital modeling and other state-of-the-art technologies." To that effect, CyArk brings the latest in survey and imaging technologies to the preservation of some of the oldest sites of human culture. Equipment was set up to conduct an HDD at Spruce Tree House at Colorado's Mesa Verde National Park. The Spruce Tree project plan details the structure's layout with instrument-setup locations.